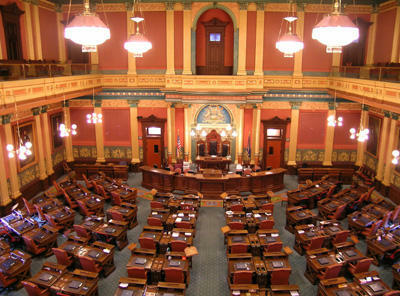 Stateside's conversation with Craig Mauger from the Michigan Campaign Finance Network. Tomorrow is Election Day. It’s an off-year election focused on local issues and races. But there’s still plenty of money being poured into these local races – dark money, out-of-state money, and SuperPAC money. Craig Mauger from the Michigan Campaign Finance Network joined Stateside today to explain how money influences our local politics, and how hard it can be to track that money. 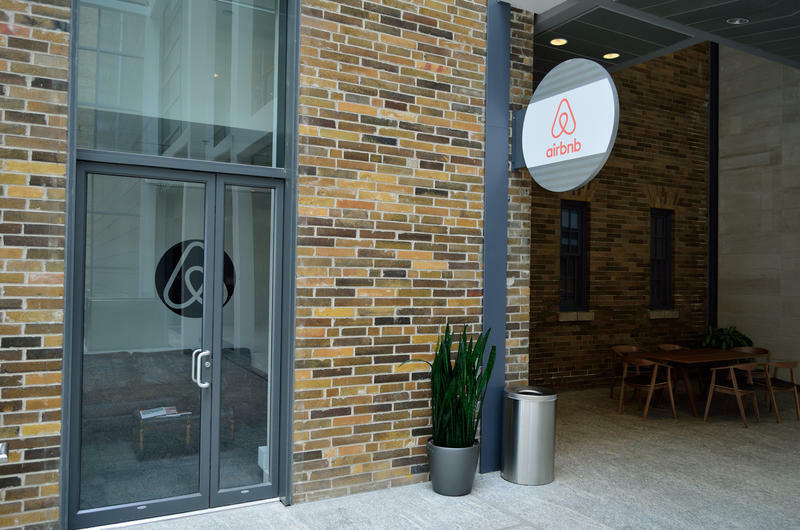 This week, Representative Jason Sheppard, from southeast Michigan, and Senator Joe Hune, from Livingston County, both Republicans, introduced identical bills that propose barring local governments from restricting short-term rentals of private dwellings, such as Airbnb accommodations. Meanwhile, Republicans in the state legislature and the mayor of Detroit agree on a position: the need to eliminate Michigan’s system of driver responsibility fees, and amnesty for drivers who still owe them. A survey of local government leaders across Michigan finds they are not happy with state government. The latest Michigan Public Policy Survey conducted by the University of Michigan heard from officials in more than 1,300 cities, counties, townships and villages. Our conversation with Eric Scorsone, a municipal finance expert at Michigan State University. He's taking a sabbatical starting Oct. 1 to join the Snyder Administration as a deputy state treasurer for local and state finance. State government has been distracted by the water contamination crisis it created in Flint, by the financial problems in Detroit schools, and the day-to-day issues that are just a natural part of running a huge operation in a large state. One issue that’s been set aside often – the proverbial “kicking the can down the road” – is underfunded pension plans and health care costs for retirees. 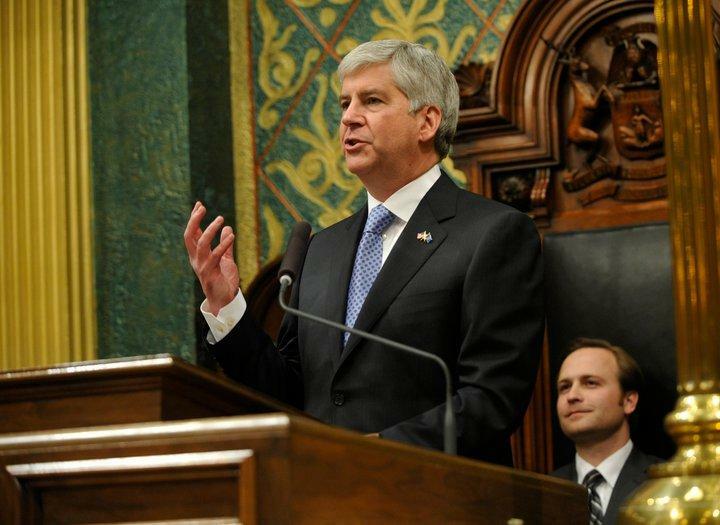 At the state level, Governor Snyder implemented a plan early in his first term to chip away at the problem. At the local level, most cities have been struggling with cutting services and just paying the bills. The idea of trying to catch up on putting more money into pension plans or setting aside money for growing retiree health care costs don’t seem to be as pressing. The result: A looming financial disaster for many cities and counties. More local government leaders are feeling insecure about their fiscal health than in years past. 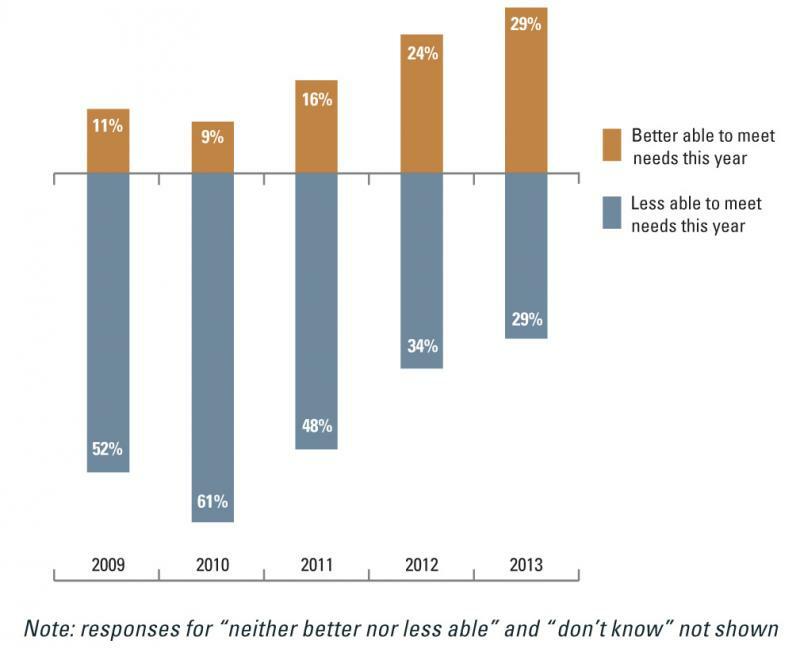 A new study shows the first decline in feelings about fiscal health since the end of the Great Recession in 2010. 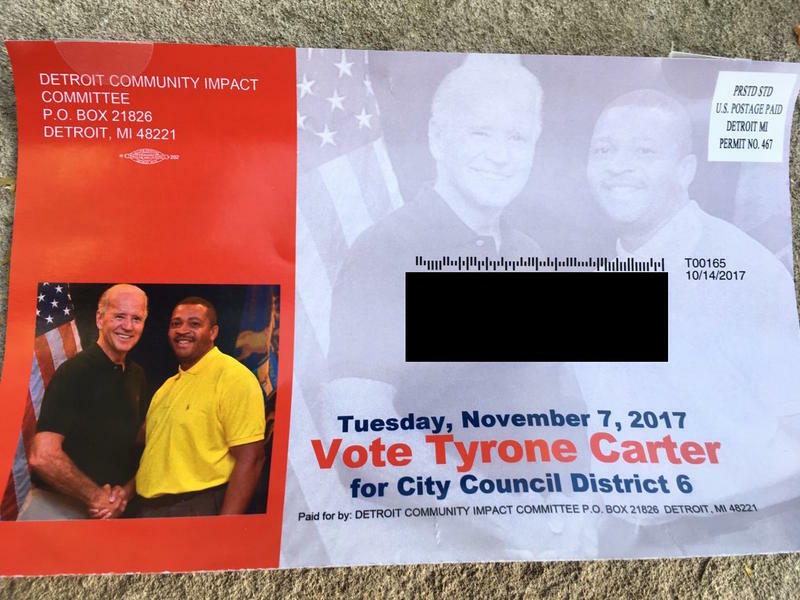 Residents of Wayne, a small community about 25 miles west of Detroit, will see a public safety millage question on their Tuesday primary ballots. It’s a slightly unusual one, though. 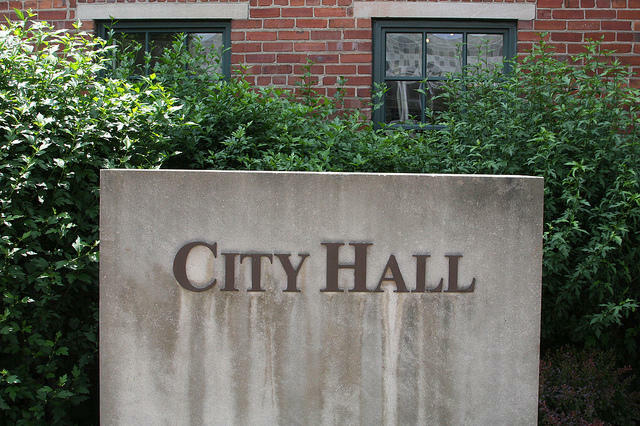 The question will ask Wayne residents whether they want to join a regional authority that funds public safety services — the South Macomb Oakland Regional Services Authority, or SMORSA. Fewer than half of Michigan’s local leaders are optimistic about the state’s direction, and more of those leaders have soured on Governor Snyder’s leadership. That’s according to the latest results from a twice-yearly University of Michigan survey. The feelings about the state’s overall direction are just slightly more pessimistic than a year ago, but down significantly from 2014, when 55% of local leaders felt good about the state’s prospects. Now, it’s 44%. 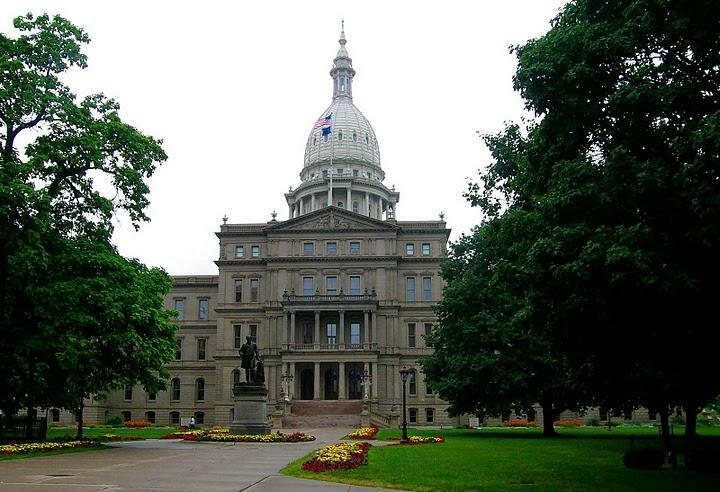 Local governments in Michigan are not happy about some last-minute language added to a bill that just passed the state legislature. Senate Bill 571 is mostly about campaign finance issues. But tucked in at the very end of the bill is a provision that cities and townships argue amounts to a “gag rule” on them. When local governments get sued and lose, Michigan residents can end up paying taxes that voters never approved and that exceed state limitations. Normally, that can’t happen under the Headlee Amendment to the state constitution. 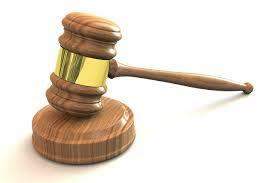 But as the result of a Michigan Supreme Court decision, there’s an exception for court-ordered judgments. Are government officials ethical in office? Listen to Stateside's conversation with Tom Ivacko, manager of the Center for Local, State, and Urban Policy at the University of Michigan. Local government officials believe they and their colleagues are pretty ethical. They seem to feel differently about state officials, however. Those are some of the findings of the latest Michigan Public Policy Survey by the Center for Local, State, and Urban Policy at the University of Michigan. Voters in Michigan’s second-largest city will decide whether to establish term limits for the mayor and city commission next Tuesday. The proposed change to the city’s charter would limit commissioners and mayors to eight years in office. Commissioners would be able to serve for eight years if elected mayor. Opponents of term limits say there’s no need for them because voters can kick people out of office by not re-electing them. 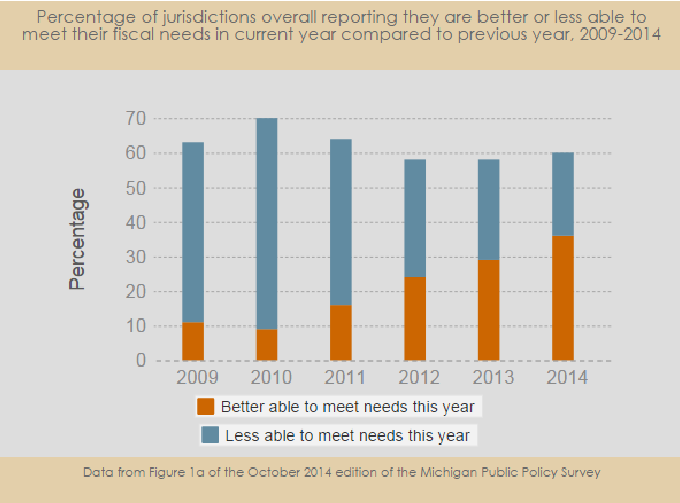 The latest Michigan Public Policy Survey shows that for the first time since 2009, more Michigan communities say they are better able to meet their fiscal needs than those who say they are less able to do so. For six years, a University of Michigan team from the Ford School's Center for Local, State and Public Policy has been doing regular "temperature" checks with elected and appointed leaders of more than 1,800 local governments around Michigan. Tom Ivacko is with the Center for Local, State and Urban Policy at the Gerald R. Ford School. He says the data indicate an important development as the state recovers from the Great Recession. 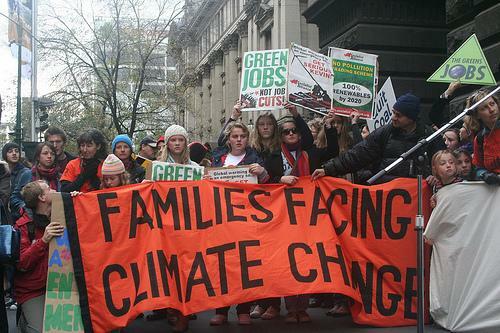 Say the words "climate change," and just watch the battle lines form. On one side, we have those – including the scientific community – who say it is not only coming, it is here and we're going to be challenged by extreme weather as a consequence. On the other side, we have those who doubt the grim warnings of climate scientists. They believe warming is just a part of nature's cycle. 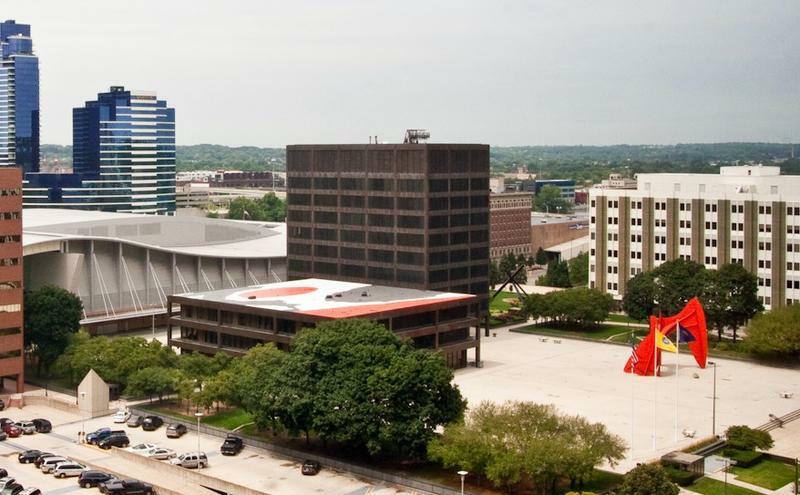 Tax increment financing, or TIF, is a flexible tool for downtown development authority boards aiming to encourage private investment and increase the taxable value of their municipality. TIFs enable portions of a city’s regular property tax to be used for economic development, without a vote from taxpayers. There are eight types of authorities in Michigan that can engage in this type of financing. 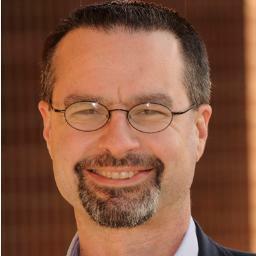 David Bieri is an assistant professor of urban and regional planning at the University of Michigan. Bieri explains the good and bad uses of TIFs. In the early 2000s, DDAs from Kalamazoo to Detroit addressed blight through brownfield remitigation. On the other hand, Bieri cites Bloomfield Park, the unfinished mini-city in Bloomfield Hills, as an example of TIFs gone bad: Blight was created rather than mitigated. 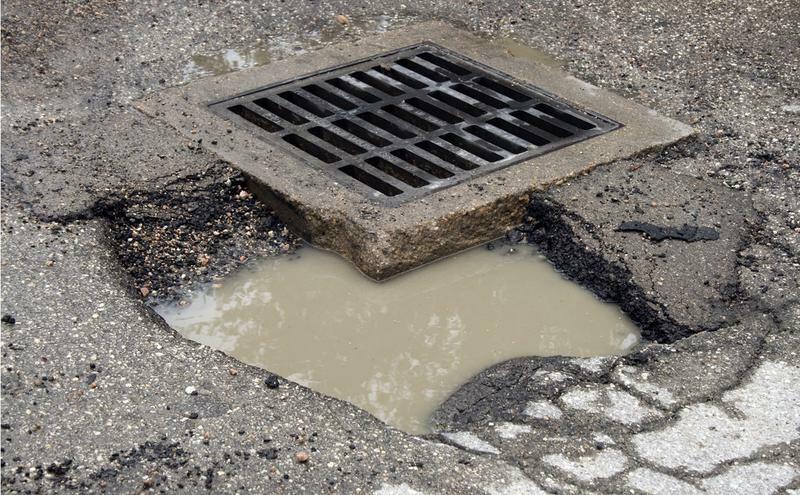 Most state leaders agree that Michigan needs to fix its roads. But they’re still struggling with how to do that. In the meantime, local governments are taking matters into their own hands. What do local leaders think about right to work? It was certainly a fiery, emotional scene at the State Capitol a year ago this month. 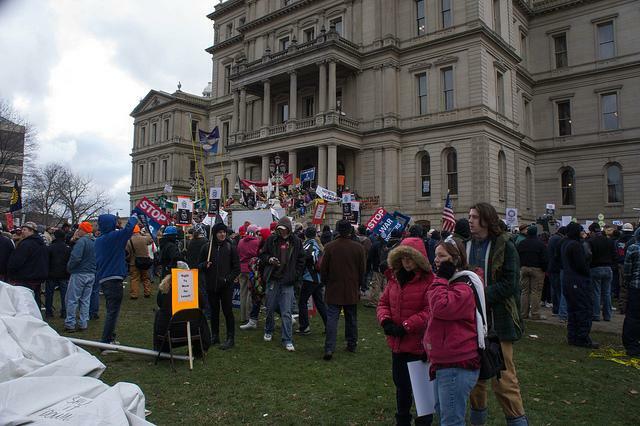 That's when the lame-duck Legislature and Governor Snyder rammed through the right-to-work law, and Michigan became the 24th right-to-work state. The laws took effect in March, making it illegal to force workers to pay union dues as a condition of employment. So what do our local government leaders think about right to work? 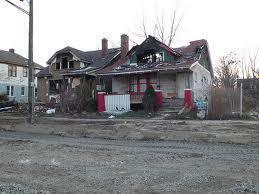 Will Detroit’s bankruptcy affect your hometown? Listen to the on-air version of this story. An extended version is below. It’s a question many in local governments across the state have been asking themselves lately. There are a couple ways Detroit’s bankruptcy could have a bad influence on other local governments. 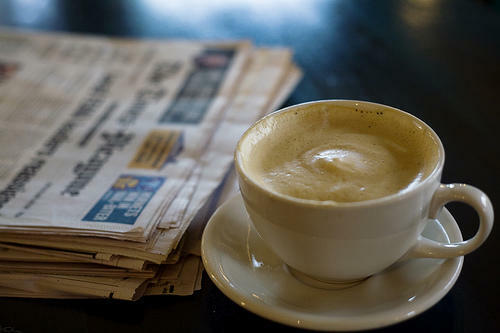 The simplest way is all that bad press the nation’s biggest municipal bankruptcy will bring. But Detroit’s finances have been screwed up for decades. That’s not news. Economists that track indicators in West Michigan say it won’t help, but they do not expect this to be a big factor. The more important way Detroit’s bankruptcy could affect small governments is much more complicated. First, you’ve got to understand these bonds are really important to local governments. A state House panel is soon likely to take up a bill that would revive medical marijuana dispensaries in Michigan. Earlier this year, the Michigan Supreme Court ruled to stop most marijuana dispensaries; but now state lawmakers say they’re close to a deal on legislation that would allow and regulate the facilities. Michigan businesses will be closely watching free trade talks starting today between the United States and the European Union. The proposed trade deal would open markets between the U.S. and the 28 E.U. countries. Rich Studley is the president of the Michigan Chamber of Commerce. Studley told Michigan Radio's Steve Carmody, "an E.U. free trade deal would primarily benefit Michigan’s manufacturing industry." 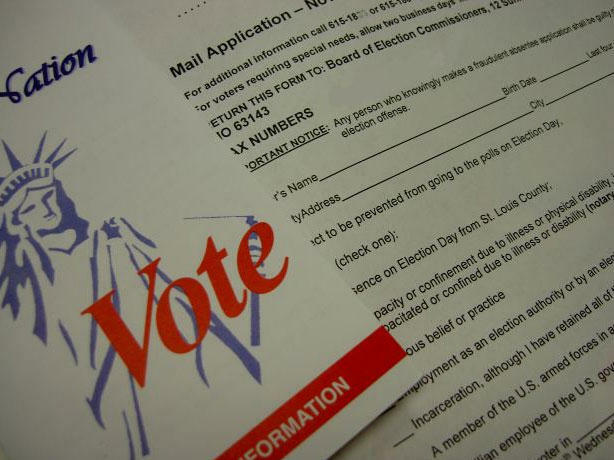 Today is the deadline to register to vote for the 56 local elections in Michigan this summer. Elections range from local primaries to school boards to city council votes. The Michigan Secretary of State is urging Michiganders to get out to vote in their local elections. Residents can go to their county or local clerk's office or a Secretary of State office to register. An interview with Tom Ivacko from the Center for Local, State and Urban Policy at the University of Michigan. How deeply should citizens be involved in governing our counties, cities, townships or villages? Put another way, how deeply do our local leaders want us to be involved? That's the question the Center for Local, State and Urban Policy at the University of Michigan put to more than 1,300 local government officials from all over Michigan. You can read more about this survey here. Tom Ivacko from the Center joined us today with the verdict. Hundreds of Michigan cities are not saving enough to cover their future retiree health care costs. A new report says more than 300 Michigan municipalities have in excess of $13 billion in unfunded liabilities for health care costs of retired public employees. Michigan State University researchers found only half of the municipalities are prefunding retiree health care. The rest are setting aside no money despite longer lifespans and rapidly rising health costs. While the collective bill of funding those benefits is $12.7 billion, the bulk of it, almost $11 billion, is attributable to local governments in a 10-county region of Southeast Michigan including Oakland, Macomb and Wayne counties. 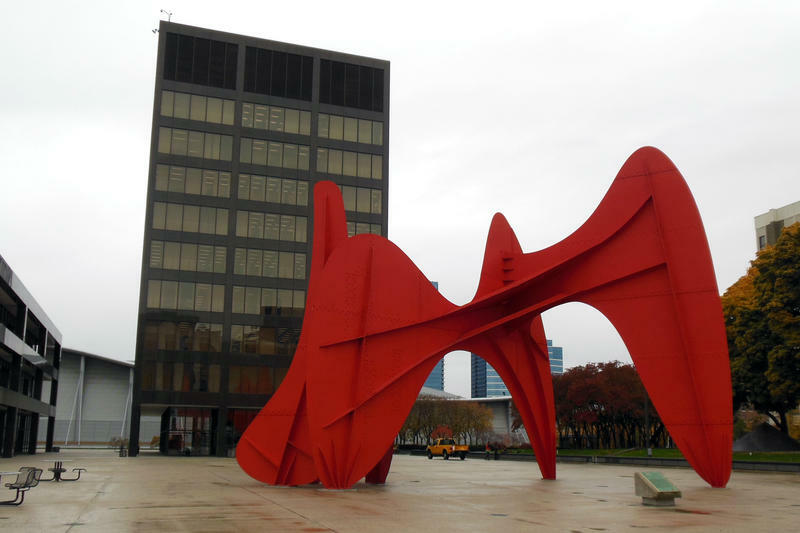 The city of Detroit alone will owe $5 billion in retiree health care costs. But MSU professor Eric Scorsone says cities like Grand Rapids, Flint, Lansing and Saginaw also face difficult choices. “That’s already happening today….these cities…are paying millions of dollars in retiree premiums so it’s already having an effect and it will have an even bigger effect in the future,” says Scorsone. 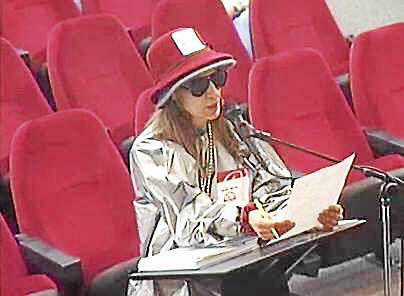 Scorsone says the new national health care law may help some. But tax increases, budget cuts or broken promises to retirees are inevitable, unless the state takes action. 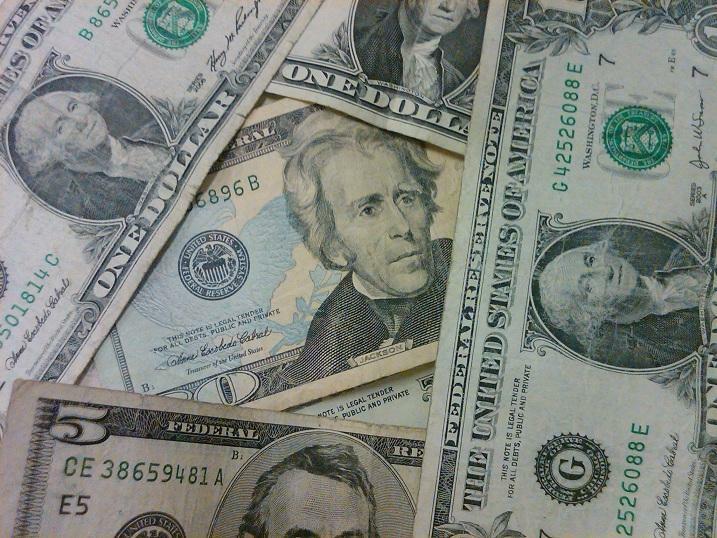 A new poll shows local government leaders are concerned about proposals to repeal or greatly change Michigan’s personal property tax. Michigan’s personal property tax focuses on assets like furniture, equipment, computers and other temporary investments. But the tax generates hundreds of millions of dollars for local governments. 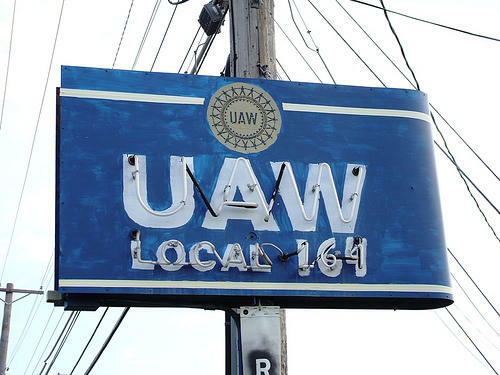 Believe it or not, many of Michigan’s local leaders are satisfied with union negotiations. According to Tom Ivacko, administrator and program manager of Ford School’s Center for Local, State and Urban Policy, the relationship between jurisdiction and its employees is quite positive. Ivacko oversees the Michigan Public Policy Survey program. He spoke today with Cyndy about these relationships. Getting along with your neighbors isn’t always easy. So Governor Rick Snyder came up with a pretty simple plan to get townships, counties and cities to find new ways to work together; give them some kind of incentive, specifically, money. Michigan Department of Treasury spokesman Terry Stanton says these Competitive Grant Assistance Grants are incentives to get neighboring cities, townships and counties to work together in new ways.